Lean back bacon cut from the loin, dry cured by hand to let the organic pork’s natural sweetness shine. The result is not too salty, just full of flavour. Unbeatable for breakfasts, or nestled between slices of soft, fresh bread for the best bacon sandwich. Contains a minimum of 6 rashers. Sizzle in a pan or under the grill for a few mins on either side, until cooked through and nicely crisp. Keep in the fridge below 5°C and use by the date on the label. Once opened use within 2 days. Can be frozen. 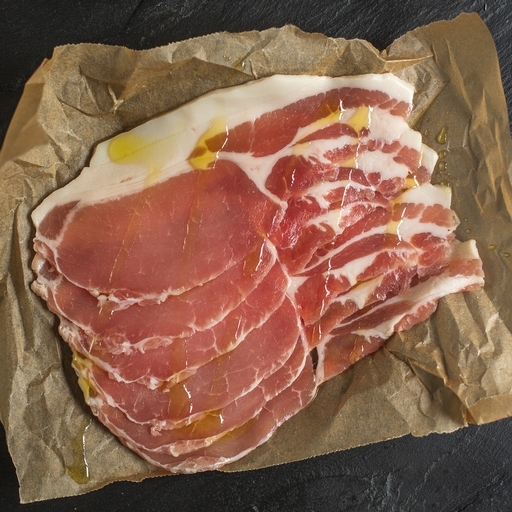 Our bacon comes from Helen Browning’s Eastbrook Farm in Wiltshire. Helen set up her farm over 27 years ago. She’s a champion of organic farming and gives animals the best quality of life – in fact, she’s Chief Executive of the Soil Association and spends much of her time campaigning for better animal welfare. Her pigs live outdoors in family groups with loads of space and fresh ground to rootle around in. Pork, salt*, cane sugar, sodium nitrite*. Prepared in a kitchen where milk and oat gluten are also handled.